NEW ORLEANS – Florida isn’t a stranger to winning national titles. After all, the Gators won the past two outdoor crowns. Then again, it has been a while since Florida hoisted the indoor trophy above its head – five years to be exact. 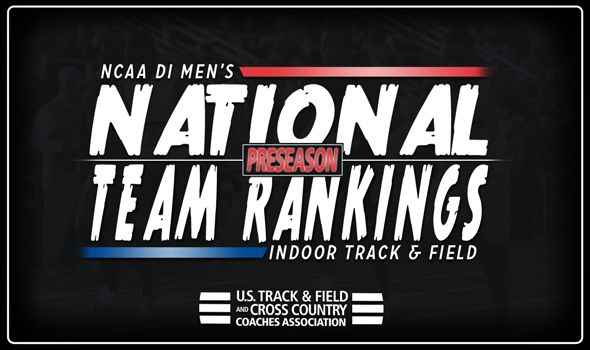 But if the Preseason National Team Computer Rankings hold their weight, the Gators will be chomping on top of the podium come March in College Station, Texas. Florida is the heavy favorite in the first index of the 2018 season, released Wednesday by the U.S. Track & Field and Cross Country Coaches Association (USTFCCCA). This is the sixth time in the past eight years that the Gators have been ranked No. 1 to begin the season. Georgia, Arkansas, Southern California and Colorado round out the top-5 behind Florida, a team that has a 67-point lead on the field. The Gators will depend on a talented quartet to take them back to the NCAA mountaintop: KeAndre Bates, Clayton Brown, Kunle Fasasi and Grant Holloway. Both Bates and Holloway are threats to score 20 points at NCAAs as the former won the long jump title and placed second in the triple jump in 2017, while the latter cruised to the NCAA title in the 60 hurdles and is a blossoming long jumper. Brown and Fasasi add needed depth to the team in the field and one-lap circuit, respectively. The Bulldogs cemented their status as the next-best team thanks to an early-season effort by Keenon Laine in the high jump. Laine soared to the top of the USTFCCCA Individual Rankings with his mark of 2.27m (7-5¼). If Laine continues to grow as a high jumper, it will be a welcomed addition to the likes of Kendal Williams (top returner at 60 meters), Karl Saluri (No. 2 in the heptathlon), Denzel Comenentia (No. 4 in the shot put) and Darius Carbin (No. 6 in the high jump). This is the highest preseason ranking in program history for Georgia, as it had never been seeded better than sixth before. Kenzo Cotton is the major reason why the Razorbacks come in at third. Cotton is the No. 2 returner at 200 meters and No. 3 at 60 meters, which could mean major points for Arkansas. Don’t forget about Obi Igbokwe (No. 5 at 400) or Trayvonn White (No. 4 at long jump). For the Trojans to be successful, they’ll rely on Rai Benjamin, Randall Cunningham, Michael Norman and the resurgence of Eric Sloan. Benjamin and Norman are heavy hitters at 200 meters, while Cunningham is ranked No. 1 in the high jump and Sloan isn’t too far removed from a dynamite sophomore year in the horizontal jumps. The Buffaloes had never been ranked higher than 12th to begin the season. Well, this isn’t your granddad’s Colorado team. Maybe it is with the depth it has in the distance events, but still. The Buffs feature three men who are ranked in the top-3 of their respective events: Joe Klecker (No. 2 in the mile), Zach Perrin (No. 3 in the mile) and John Dressel (No. 3 in the 5000). Colorado State came in at a program-best No. 6, followed by No. 7 Oregon, No. 8 Virginia Tech, No. 9 Alabama and No. 10 Texas Tech. Texas A&M, last year’s national champion, starts the season in 17th place. There is a lot of time for things to change between now and March 9-10 when the 2018 NCAA Division I Indoor Track & Field Championships will be held in College Station, Texas.